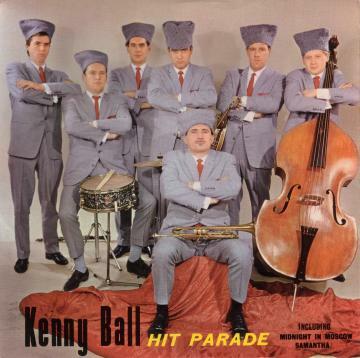 Kenny Ball and his band had the most successful and longest lasting chart success of the Trad groups that came to the fore during the early 1960s. His success was probably due to a number of factors including his own skillful trumpet playing and a judicious choice of material. Although the band received crticism from elitist jazz 'purists' for venturing too far from the boundaries (whatever they are) of traditional jazz, Kenny helped to maintain the genre's high profile throughout the 1960s. Kenny Ball's list of hits include many on which he sang as well as played. These include his first chart success 'Samantha' and his last chart success 'When I'm 64'. Kenny is now well over 64, but is still loved by the many traditional jazz fans that he enlisted during its era of greatest popularity. Hopefully, after this photograph was taken, nobody stepped back onto that clarinet! Tempo Exa83 1959 "Kenny Ball Jazz Band"
Pye NJE1086 1963 "Kenny Ball Plays"